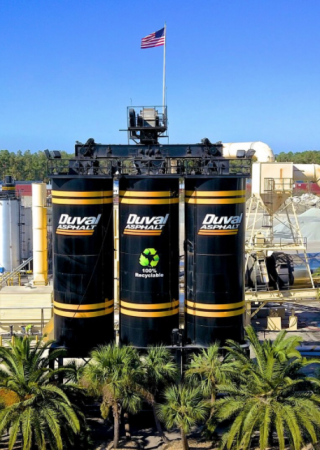 Duval Asphalt is always seeking to use products, processes and methodologies that help us and our customers save energy, conserve natural resources, and accomplish more with fewer environmental impacts. Many do not realize it, but asphalt is the sustainable material for constructing pavements. From our Jacksonville asphalt manufacturing plant: production to placement, rehabilitation and reclamation, asphalt pavements minimize impact on the environment. At Duval Asphalt environmental stewardship has always been a top priority. Both of our asphalt manufacturing plant locations are rigorously cleaned, maintained, and beautifully landscaped with more than 100 palm trees and other native vegetation. We have received more than a dozen Ecological Awards from NAPA over the years for our efforts to maintain clean, environmentally sensitive and beautiful facilities.